Hillary Losing Backers to Barack? The presidential campaign of Hillary Clinton, the Democrat frontrunner, is facing a wave of defections by supporters to Barack Obama, as an aura of “inevitability” about her nomination fades. 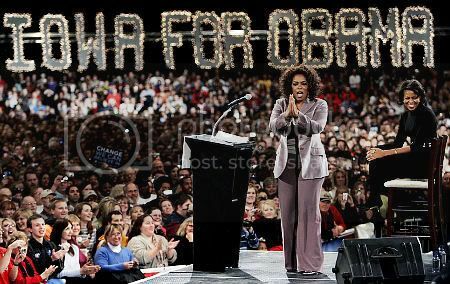 With Oprah Winfrey, the talk show host and Obama enthusiast, challenging former president Bill Clinton for star power on the campaign trail, the coronation of Hillary has been put on hold. A few days ago, Helen Quarles peeled off the Hillary for President bumper stickers from her car and replaced them with Obama ’08. Yes, this is what the Hillary Clinton Campaign, who I call affectionately, Team Clinton had to say about going after Barack Obama. Well, we waited. And we finally got the magnificent press release from Team Clinton, last Sunday. Among the explosive oppo research was the reference to Obama’s aspirations to become president, as early as kindergarten. Yes, kindergarten. Oh, and then it expounded on his refined penmanship in kindergarten and third grade with examples of his essays on “I want to be President” topic. Well, the media love fest was frenzy this week. I mean who knew??? Who knew??? Obama wanted to be president in kindergarten!!! Hell, I wanted to be Diana Ross, one day, then I wanted to be Cleopatra Jones (yes, throwback, y’all), meaning I wanted to be so many people, my parents would just say, “that’s wonderful, sugar.” Oh, and then Team Clinton strategist, Mark Penn, tries to clean this up on Morning Joe, and said it was a joke. Do they think people are stupid? Sigh, then Team Clinton gets caught up with a tempest in a tea pot. Their own staff was found out emailing the muslim smear against Barack Obama. Yes, good old Team Clinton who said, “Let the Fun Begin! !”, now looks sophomoric, at best, in handling all this through the week. Isn’t Hillary Clinton the one who is vetted, tough, tested? Yet, doing this stuff? And is this the best they have on Barack Obama? We must be honest here, the Iowa Caucus is three weeks away and if you want to bring someone down, now is the time, not later. But kindergarten papers? Getting caught sending muslim smears? Is this the tightly run campaign that everyone has bragged about all year? They look very amateurish, to me. Well with Iowa Caucus 24 days away, around that, the polls are fast and furious. All these polls show erosion of Clinton, steady for Edwards and emerging for Obama. So, it is safe to state that Obama is catching Hillary. Democrat Barack Obama on Wednesday advocated a major expansion of the Peace Corps, AmeriCorps and other national service programs, declaring, "This will be a cause of my presidency." The Illinois senator said the government is not keeping pace with those who want to help. "We will create new opportunities for all of us to serve," he said at a rally at Cornell College. Obama evoked the memory of President Kennedy and his Peace Corps volunteers, saying, "JFK made their service a bridge to the developing world." Despite growing anti-Americanism around the world, he said, "the American people are not the problem, they are the answer." Obama, a senator from Illinois, said he also would expand the all-volunteer military but would "never send them to fight in a misguided war." A Princeton professor and outspoken expert on African-American culture said he believes U.S. Sen. Barack Obama's candidacy for president is an important breakthrough for blacks -- whether Obama wins the Democratic nomination for president or not. But Cornel West believes Obama is going to win. Speaking Monday night to thousands in the Joe L. Reed Acadome on the campus of Alabama State University, West said he believes the Illinois Democrat, after running behind U.S. Sen. Hillary Clinton of New York for most of the presidential race, has turned the corner. 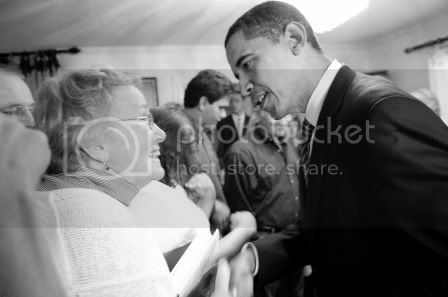 new iowa ad, "our moment"
While Barack Obama is battling Hillary Clinton in the Democratic race, he can enjoy a small victory from those who vote with ears more than hearts and minds: He is one of five contenders for the Grammy Award for Spoken Word, one of 110 categories this year. If only nominations on the campaign trail were decided so easily and early in December, just as primary season continues and eyes remain fixed for the 11 months until Election Day. As is the custom in New Hampshire this time of year, I recently asked a woman in a coffee shop who she was supporting for president. Her answer: “The last candidate I heard speak.” The point is we have a remarkable group of candidates, so it’s no surprise most voters remain undecided. As the date gets closer, and more and more people ask who I’m with. After many months consideration, I’ve finally made my choice. Kucinich deserves to do well in New Hampshire. His bold and uncompromising vision needs to be heard. Bill Richardson would make a great chief executive, with his unmatched experience. But inspiring personal presentation (also called charisma) is a job requirement which is not his strength. Chris Dodd is consistent on every issue, and is a terrific speaker. I wish his numbers were at least as high as Kucinich. 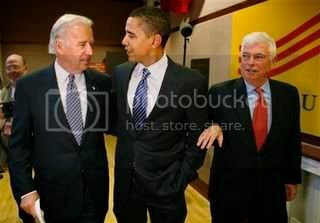 Same goes for Joe Biden — great on the issues, a captivating speaker too. Just not connecting enough. That leaves the “top three.” Before the Republicans have laid a glove on her, Clinton starts out with 50 percent of Americans saying they would never vote for her. She’s relied on an engineered aura of inevitability. She buys into the all-things-to-all-people style, the course laid out for Kerry by his political director Jeanne Shaheen. Straddling everything doesn’t win. Some people say it’s time for a woman. Martin Luther King hoped we would judge people by the content of their character, not by their color, or by extension, their gender. A new direction? 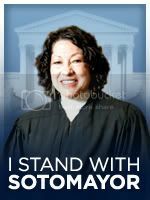 What about support for the war in Iraq, her prideful refusal to accept that she made a mistake, her unconscionable vote declaring part of Iran’s government to be a terrorist organization (giving Bush the carte blanche to attack)? Her commitment to keeping combat troops in Iraq and her refusal to say she’d get them all out by 2013? Her blatant pandering to the right on flag-burning, and on late term abortions? And then there’s planting softball questions for herself to answer. 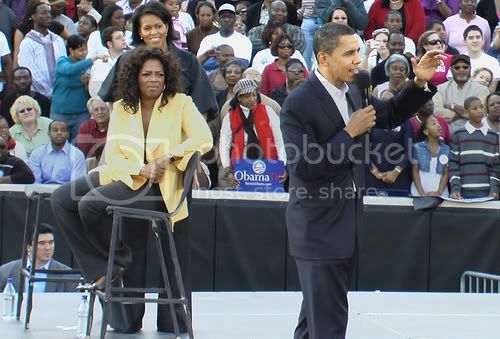 icebergslim’s last word: oprah. dirty campaign tactics. change. This was another weird week for Barack. It was. First it was Team Clinton’s hilariously, funny press release last Sunday. The cincher was that Barack has had aspirations, ambitions to become president in kindergarten and third grade. As the witness to his third grade papers, promptly waved for everyone to see. Oy!!! Nothing is nicer than to be in a tight race in the early states and folks laughing at the front runner’s pettiness. Then Barack had to deal with the on-going muslim email circulation. Obama is not a muslim, he is a Christian and now his name is being used against him. Well, guess what popped off? Team Clinton’s staff caught sending and spreading this rumor. Of course, the culprits were dismissed but the damage is done. One cannot do anything but view Team Clinton as desperate and will do anything to win, even if it means spreading a lie. Oh, yes, Team Clinton denounced it, but the damage is done. It really is. 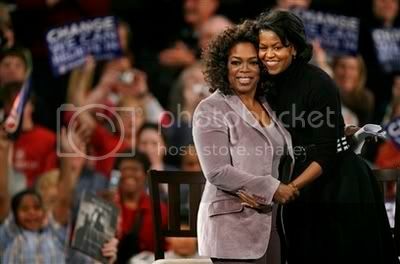 Then we have Oprah Winfrey. I am one who has repeatedly said endorsements mean nothing. It does not. The candidate must seal the deal him/herself, no endorsement can do that. 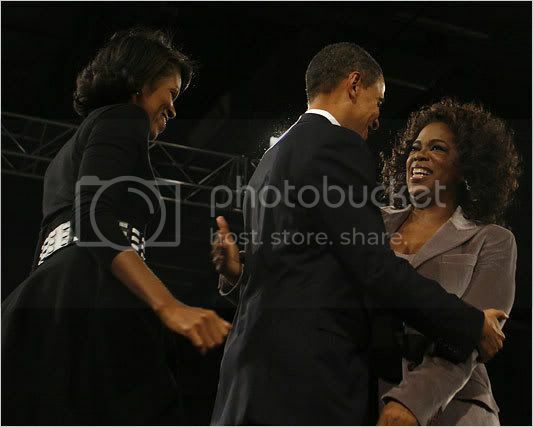 But as this week has progressed, so did the energy of the Obama/Oprah weekend. 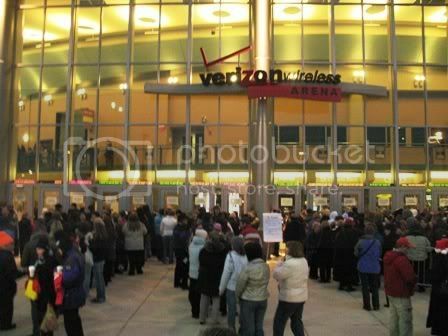 Suddenly, everyone was talking about it and when Columbia, South Carolina had to move the venue to an 80K stadium, well what else could one say. Yes, a politician who is so eloquent but will not mince words. He will tell it to you with a tongue dipped in the unvarnished truth. That statement said it all for me. 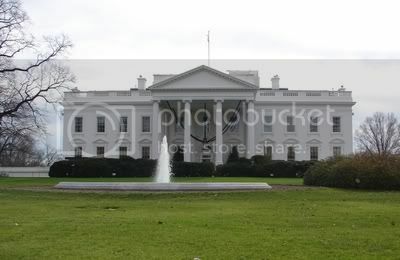 It is about time we got a statesman in the White House. It is about time we got someone who is honest and unafraid of the truth in the White House. This has been missing so long, we forgot how it sounds. Since the 90’s to now, we have had to deal with untruth in the White House. Yes, we have had to deal with it. And we are tired. Just sick and tired of it. Change. This battle is about change. It is. It is not about electability because the three top runners are electable. No, this argument is change and what kind we want. After seeing over 18K in Des Moines, over 10K in Cedar Rapids, over 30K in Columbia, SC, what do you think? People do not go to political rallies for anything. They go searching and seeking an answer to the question. And as Oprah Winfrey said, “I am here to tell you, Iowa, he is the one. He is the one!" 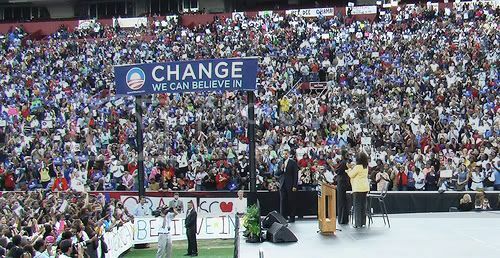 well, as we see the 30K crowd out to hear barack, oprah and michelle, in columbia, sc, things are moving and evolving at break neck speed. we are in ties or slightly ahead in many of the early state polls, which shows we have the momentum. 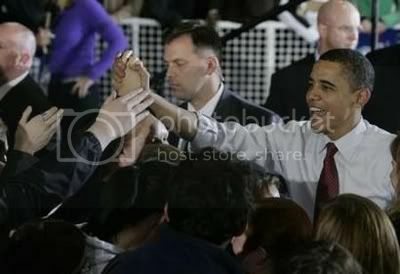 people are showing that they want change and barack obama is that change. as we move into the holiday season, remember the nastiness and sheer jealousy will continue to increase. rise above it. keep your eyes on the prize. focus on obama and not the drama.